Setting up the HootSuite integration is a two-part process that happens both within Kapost and within HootSuite. In HootSuite, you can install the Kapost App which will allow you to send posts from your stream into Kapost as ideas, as well as create a Kapost-specific stream that contains all of your content in Kapost. In Kapost, you can integrate with HootSuite the same way you would any other app, which allows you to promote your content from Kapost to Hootsuite for your social marketing team to manage. Learn more about our integration with HootSuite here. Go into your HootSuite account and access the App Directory from the sidebar on the left. When the app directory window appears, search for "Kapost." When you find the Kapost app, click "Install App" button. In this image, the Kapost App is already installed, but you can normally find the "Install App" button on the top right. 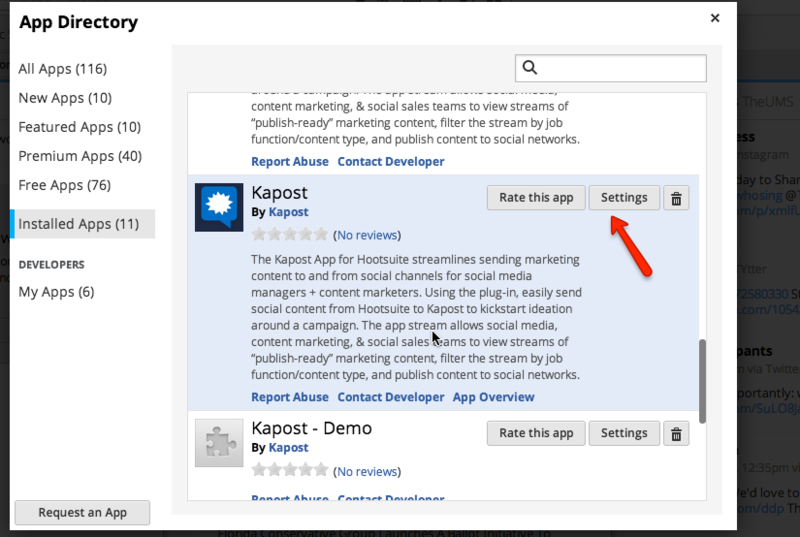 Once the Kapost App is installed, you will have access to two streams (Kapost Promotions and Kapost Content Catalog) in HootSuite. To activate the streams, click on the "Add Stream" button in the top right corner. When the window appears, click "Apps." When you choose the Kapost content stream and or/promotions stream, you will see a "Connect to Kapost" button that will prompt you to log in with your Kapost user name and password. Fill out your info and connect to Kapost. The Kapost Promotions stream will contain all of the promotions sent in from Kapost. This is the stream your Social Media manager will want to monitor to know what content has been published and what content is ready to be promoted. The Content Catalog stream gives HootSuite users access to all of the content published from Kapost. Users can filter for the content they need and easily share it with the prospects they are talking to. Installing the app also adds a plug-in to all of your other social media streams where you listening to conversations taking place in Twitter, Facebook, etc. The plug-in allows you to send any Tweet, Facebook post, etc. into Kapost as an idea for a new piece of content. For more info on how to work with these streams and plug in, click here. 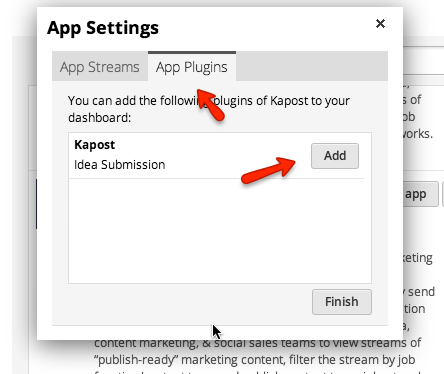 This integration allows users to send posts directly from Hootsuite into their Kapost Ideas stream. To do this, you need to enable this feature in Settings. In Hootsuite, go to your Apps Directory. Scroll down to your Kapost app and click "Settings." When the lightbox appears, choose the "App Plugins" tab and click "add" next to Idea Submission. You will now be able to send posts from Hootsuite directly into Kapost. Note: HootSuite will NOT ask you for any of your authentication information. All of that happens in HootSuite when you install the Kapost App. Once you have integrated with HootSuite, add it as a promotion destination to any content type. Now you will be able to send promotions from Kapost to HootSuite for your Social Media manager to act upon. For more info on how this works, click here. If you have any questions about integrating with HootSuite, please don't hesitate to email us at support@kapost.com.